Last summer I bought a similar pair of Chloe/Celine "influenced" sandals and proceeded to wear them literally to non-stop. The gold heel ads a little excitement to the classic shape and takes them from retro to minimalist. I will definitely be replenishing my collection this summer. I just got these beauties and they're amazing. Definitely worth the buy. What a great find! Definitely the perfect sandal for summer! 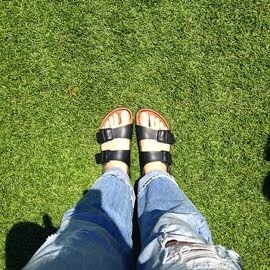 I recently bought these sandals and they are great. Comfy and cute. I definitely think you buy them!